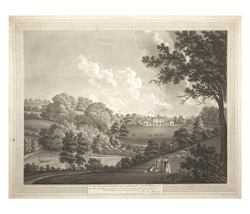 View of the Leasowes, a landscaped park designed by William Shenston in the 18th century. As can be seen in the print, it contains small lakes, steeply wooded hillsides and open grassland. Shenston was born and educated at the Leasowes and was known as a poet: his poetic works achieved popularity in the 1750s. Forced to economise because of the prohibitive cost of creating a traditional formal gardens in his estate, he transformed the grounds in a highly picturesque way. He planted trees and shrubs to enhance the natural landscape, introduced watery cascades and streams and dotted the grounds with ornamental seats, ruined temples (there was also a ruined Priory in the park). The popularity of his park spread, particularly after the publication of 'A Description of The Leasowes' by Robert Dodsley in 1765. Visitors to the park followed the recommended 'Circuit' path so they could enjoy the varied topography of the landscape.